Dark green leaves with pointed tips with a mild cucumber taste. Pretty blue star shaped flowers which along with the leaves makes a nice addition to a salad. Freeze the flowers in ice cubes for an unusual addition for drinks. 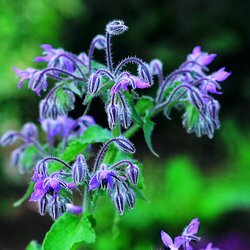 Can be used as a companion plant for pollinating your vegetable plants as Borage flowers attract the bees. Roughly 8 weeks after planting.